1. What Factors should be considered while selection for Gasket ? The performance of the gasket totally depends upon the type of selection and from the material from which it is manufactured. Below are the factors that should be considered while selection of the gasket. > Chemical Compatibility with the process fluid. > Pressure of th media. > Temperature of the media. > Other consideration like gasket designing factors, safety etc. 2. What does the marking on Spiral Wound Gasket indicates ? > Nomianal Pipe Size and Pressure Class Of the Gasket: 6 X 300 (6 NPS and 300 PSI). > ASME B 16.20 Designation. 3. Why sometimes inner Ring is reffered for Spiral Wound Gasket ? Inner Rings shall be furnished with all the Spiral Wound Gaskets Having PTFE Filler Material. > NPS 24 and Larger In 900 Pressure Calss. > NPS 12 and Larger In 2500 Pressure Calss. > NPS 4 and Larger In 2500 Pressure Calss. > Prevents the Inward Buckling. > Increases Tightness in the Gasket. > Created Resistance to Blowout. 4. 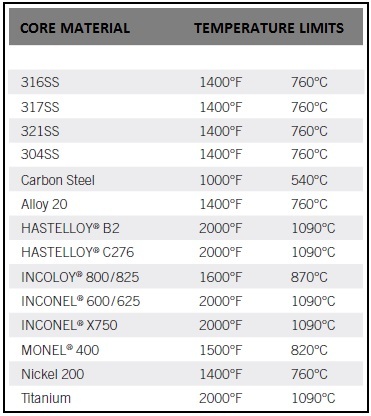 Is there any Limit for Temperature in Spiral Wound Gaskets ? MOC(Material Of Construction) for Spiral Wound Gaskets On the Basis of Temperature can be done keeping in mind the temperature limit for the filler and the windning material. 5. What is the substitute for as best to filler in Spiral Wound Gaskets or Double Jacketed Gasket ? Now a days, Graphite has proved to be an effective substitute for the same. 6.What should be kept in mind while selecting the material for Ring Type Joints ? While selectint the Material for Ring Type Joints, temperature should be kept under consideration and the most important thing to keep in mind is that the Gasket Material should be softer than the flange material so as to prevent any deformation in the flange surface. 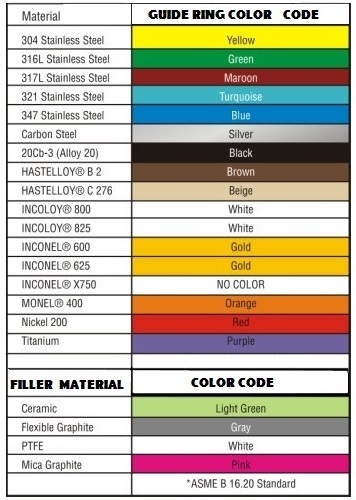 7. what color codes are being followed for Spiral Wound Gaskets as per ASME B 16.20 ? As per ASME B 16.20, Metal Winding in the Gasket is Designated by the color on the outer edge of the centrering ring. Filler Material for NPS 1.5 and larger shall have four intermittent stripes spaced appx. 90 degree apart on the outer edge of the centering ring. For smaller sizes, Gaskets shall have Minimum of two stripes 180 degrees apart. 8.What to do if the centering Ring width required is too less say 4mm ? In such cases, It is possible to manufacture such Ring but in order to save time, A nose with the same thickness as that of the ourer ring is winded around the Gasket whose Purpose is same as that of the centering Ring. 9. What is a Nose ? Nose is a Replacemetnt for the centering Ring having too less width. Its Purpose is same as that of the centering Ring and is Generally applicable for the large size heat exchanger Gasket. Its thickness is less than the thickness of the Gasket. If the Gasket thickness is 6.5MM, then Nose thickness will be 4.5MM.